This is a 51 day war account of the how daily lives during the third war on Gaza unfolded one day to the next for its devastated and grieving citizens. This is a heartbreaking nightmare. War is not just the numbers nor the political rhetoric it often masks itself in. In the end, it is about people coming to an abrupt end; and the continuum of life stabbed in the heart. In the end, it is about fear; constant fear, till cease fire is declared. Its our earnest request that you read this. Houses are no longer warned before they are bombed. Entire families have been killed and photos of injured and dead children are coming on a daily basis. Every picture is a story of its own. It is a face of a family who once was happy, safe and whole. Families that from now on will never be the same and will always grieve a beloved. It is very difficult to choose the hardest situation to talk about when every single situation is hard and matters. Yet, your tears will run in front of parents grieving their child, standing helpless, not knowing what do. What do you tell the elderly when they lose their children and their grandchildren? After all it is summer holidays now and it is useless to bomb schools. My little sister who is nine years old, told me today that her biggest fear is if and when Israelis shoot our house and every one of us die except her, then where and whom will she live with? My little brother and I went for a walk today and we passed someone we know driving his car. Also we walked near a mosque and worried that it might be bombed so we sped up. The mosque was not bombed, but that car was and the driver is fighting for his life now…. Is it 6 days already??? Displaced families in northern areas of Gaza Strip are taking shelter in schools. They go to UNRWA schools as they believe it won’t be targeted, it is UN after all, right? Yet in 2009, an UNRWA school was bombed with illegal weapons while people were in it for shelter! What a nice occupier we have? They sent those displaced families a leaflet explaining which areas will be targeted, what street they should take for evacuating and at what time? But the most important thing they forgot to tell if, whether and when they will return to their homes! Targeting people, houses and mosques continued under the threat of a ground operation. Meanwhile, the support I see through the social media for us is overwhelming and makes me wonder: what if social media was as active more than 60 years ago? I think the whole world would have seen Israel for what it really is, just a forced-state of terrorism…. Remember that car that was bombed day before yesterday? The driver who was fighting for his life lost the battle today, after suffering severe injuries in his head. He was targeted while he was on duty as an employee of local municipality to ensure that houses get the water they need. He was bombed while driving a municipality car. He is one of the many who have been on duty since the beginning of the war, especially doctors working 24/7 doing there best in the light of limited resources in the hospitals. Most of them have not gone home since last seven days and on top of that while fasting in the holy month of Ramadan, how, when and where will they break their fast? Certainly not in the operation room! Amongst the Palestinian doctors you will find a Norwegian doctor who came to Gaza once the war started, marking his presence in all three recent wars on Gaza Strip. These doctors are not just giving their time and energy but also their lives as they are an equal target, especially paramedics who never hesitate to go out and help who need their help. They are the ones who deserve the world cup of bravery. of Education announced the results of Tawjihi or 12th grade. It is an important stage in every student’s life as it determines one’s university future. But this year’s Tawjihi results are special for different reasons. Not only have they been announced during the war on Gaza strip, but also many Tawjihi students were not there to celebrate their success, 35 of them! They have been killed by the Israeli attacks. What a feeling a mother must be going through while distributing sweets mixed with her tears to celebrate her martyr son’s success, who will never join any university. Since day one of this war children were a target like anyone else. Children from different age groups- from unborn in the womb of their mother, to newly born upto teenagers have lost their lives. They were targeted in different areas- homes, streets, cars and mosques. 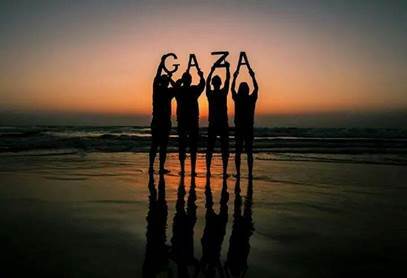 Today 4 children aged 11, 10, 10 and 9, who were playing on the beach in Gaza Strip were targeted by Israeli military ships. They didn’t stand a chance and were killed immediately. In the very first picture down here you will see that a nearby area from the children was targeted first, so that the children start running for shelter. Then they were immediately targeted leaving them dead and others wounded. Those Israeli ships with all the technology they have would have never mistaken them for freedom fighters or even civilian adults. It was crystal clear to them that they are children, just innocent children playing on the beach. If this single crime doesn’t convince you that Israel is a forced-state of terrorism then nothing else will. And I am not going to apologise for the cruelty of the pictures. In 2011 I was granted a scholarship for my postgraduate studies in England. The name of my scholarship is Al-Fakhoora, and it was established and named after a United Nations school in the north of Gaza Strip which was targeted by Israeli war-tanks in ‘Operation Castled’ in 2008- 2009. The estimated number of people who lost their lives was 46.
hit with shells from war tanks. UP UNTIL THIS MINUTE, the hospitals can’t be evacuated…. A 12-hour ceasefire took place today; those few hours exposed the severity of the destruction in some of the neighborhoods that were restricted frombeing entered. 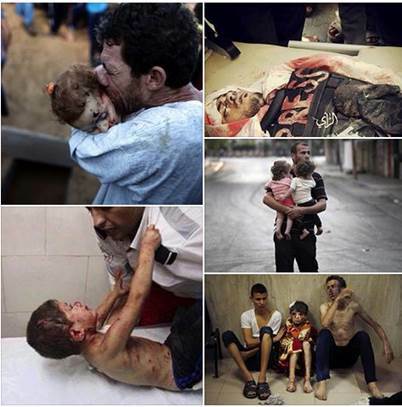 The faces of the tragedy were finally revealed after it was hidden within the darkness of the bloody Israeli hands. The wounds of the people who fled their houses were re-opened when they saw their life and memories turned into piles of rubble. But what breaks your heart the most are the bodies of their loved ones who have been removed from underneath the rubbles, forcing their families to re-live the pain of their loss. Tomorrow is Eid Al-Fitr, a celebration we have at the end of the holy month of Ramadan. Eid is a time of joy and happiness especially for children, but not this year. In the picture you will see Mohammed carried by his father at his funeral. 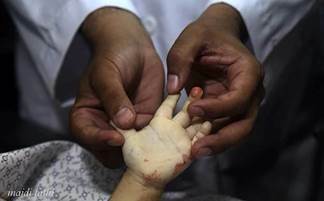 Mohammed was 2 years old, and if he was with us, tomorrow would have been so different for him. He would have been probably too excited to sleep, his daddy must have taken him downtown and bought him a new suit and a small shoes for his small feet. On the morning of Eid, he would have worn that suit, combed his hair and with few drops of his dad’s perfume; Mohammed would be running, smiling with a tummy full of sweets. None of the above will happen with Mohammed. 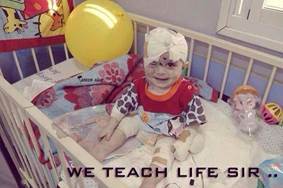 His smile was a threat to the security of Israel. Mohammed will celebrate Eid in heaven and he won’t be alone. His father joined him just a day after. A wife and a mother who is left behind in their family, will mourn their deaths this Eid. Nothing is left in this Eid but broken hearts, and stolen smiles. Eid Mubarak to 236 Mohammeds in Gaza. 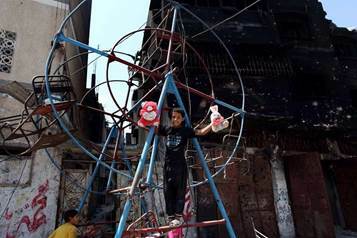 In Gaza your childhood is measured by how many wars you have managed to survive. are good at beating their high scores when it comes to Palestinian death tolls. My Facebook page is full with people praying for themselves and their loved ones, and some of those prayers sound like last prayers to me. In the news, they showed a house in my city which was targeted and eight people lost their lives of which five are women, and this is just here, there are more like that all over the strip. Gaza Strip is on fire tonight; they are bombing everywhere, literally everywhere. People are praying for the day light to come sooner this night so it can erase some of the darkness away. A mother told me today that last night all her children wanted to sleep together in one room, as the weather is hot and the room is ai ry. She didn’t allow them and asked them to sleep is several rooms. She said: ” if anything happened and the house was targeted, at least they will be in different places, if they all sleep in one room and it was hit with a rocket I will lose them all, but like this I hope some will survive”. Another woman was sitting next to her disagreed and explained that she would rather sleep together and die together. She didn’t want anyone to be left behind suffering the loss of their family, in case they are bombed. I would agree with that. the rocket which will hit the house usually takes the whole house down, it doesn’t matter which room you sleep in. What really matters is that you tell your children how much you love them before they go to sleep. One never knows who wakes them up, you or an Israeli warplanes. Well, I guess Israel was right today, I mean they chose the right targets to support their security. Look, they targeted a UN school again which had families taking shelter in the building. Then they targeted a market, again a good target, I mean how dare we try and live our life, we don’t need to get fruits and vegetables anyway, they are luxury, we need to stick to their bullet diet. Like this, we might not be considered as a threat to the security of Israel. Israel’s dirty game to break us is not working, hence they are going more mad than before. Meanwhile we will keep getting our fruits and vegetable from our markets. 72-hour ceasefire will start tomorrow, Friday at 8 am. I am glad they said 72 hours, not three days, 72 sounds longer than 3. We need an hour to count the wounded, an hour to count the dead and another to say goodbye. We need an hour to kiss the sun, and an hour to sleep under the moon. We need an hour to grieve a child and another to buy a lollipop for a child. We need an hour to breath clean air and an hour to smell the flower. Then in the rest of the hours, we will try to put together a thousand shredded pieces of stolen lives. and my neighborhoo d, where all my family and I live. As I am writing this post there is a continued aerial bombardment and the zzzzzzz noises are louder than every night. 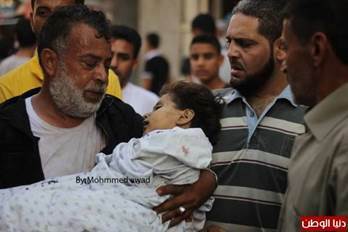 So far the death toll in Rafah has reached 62, just for today, no need to say that most of them were children and women. A whole neighborhood was bombed by Israeli tanks, and the bodies of innocent people were on the streets. The main hospital in the city had to be evacuated; it is their punching bag now. There is no space left in the morgues anymore. The day that was suppose to be the first day of a three day ceasefire turned out to be another bloody day. No one is in the streets, and there is no entry and exit from the city. We are surrounded by Israeli tanks and war-planes. 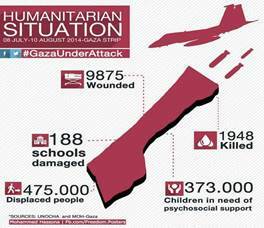 Regarding the rest of the Gaza Strip, it is the usual- families being killed and houses being bombed. 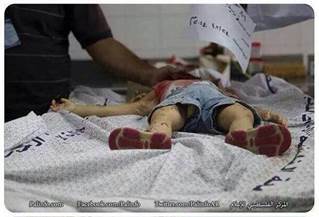 It is in the night time when the Israeli thirst for blood is on its peak. Night is the time when they commit their crimes. The last time I slept at night was 27 days ago. My family and I remain awake all night, most of the time watching news or just talking and talking and talking. Israelis prefer bombing at night to kill some and scare the hell out of the rest of us. Under the dark skies everything is maximized, the rockets’ sounds, the war-planes’ sounds and the deadly silence that follows. Israelis enjoy killing people while they are asleep, they want to spread horror, and wake up the children in the middle of the night screaming and running. They want to break our strength and our faith. They are just some cowards hiding under the cover of the dark. It is when the sun rises we release the breath we were holing all night long. It is the sun that clears our skies and sends us some peace. Every time the sun sets everyone just goes home, and says, here comes the night and the terror it brings. As much as we were isolated when the internet was disconnected for three days; it felt good to be away from the worrying online news. It was almost like a holiday away from the war, especially as it was followed by a three day ceasefire. When one is in a relatively-quiet area, and watches horrible news, somehow deep inside the mind, one keeps saying it is not near us, it is away, it won’t happen to us. One is convinced that watching the news is different from being in the news. When the Israeli army went deep inside the neighborhoods of my city, Rafah, it just felt more real than it already is, and it made us think, we are next. The ceasefire was very much welcome and for the first time since this madness we slept at night and had breakfast in the morning. We went out in the garden and enjoyed the sun without keeping an eye on the sky. The ceasefire will end tomorrow 8:00 am. No one knows what will happen next. Again, I have prepared my emergency bag, which has this printed: KEEP CALM AND FREE PALESTINE. How does it feel when Israel shoots a rocket near you? There is no way to know when a rocket will be fired from a war-plane but there is a window of barely two seconds when one gets to know that it has been launched. The strength of the sounds depends on how near it is. At the beginning, one sees a strong red light in the sky; after that one hears a very thin and strong hissing sound of the rocket while it goes to its target. This hissing sound is the worst. Even worse than the sound of the explosion once it hits the target. Since the year 2000, we have been hearing these sounds and it has always felt the same. During these two seconds, one holds their breath along with their life, listening, anticipating, and wondering where it will go this time. Is it coming towards us? Then comes the explosion, a very strong sound that one hears inside the head, and feels it as if every cell in the body is going to explode. Sometimes the sounds are very strong, shaking up the houses. We joke about it saying the house is dancing. Upper floors shake more, that is why during the attacks people will usually go to the ground floor if they can. While I was writing this, an area near us was attacked with at least 15 rockets or so. I wonder if Israelis are done for tonight. Have a look at some of the rockets that were launched on Gaza. Look how huge that thing is, and just imagine the destruction it will leave, and they are not just one or two. my house there is a large ‘fridge’ that is used for flowers farm. During the attacks in my city, Rafah, the number of people who were killed by the Israeli army out-numbered the capacity of the hospitals’ morgues. They found alternatives in flower fridge, and in one case an ice-cream freezer was used for children’s bodies (see photo). Children always look into an ice-cream freezer with joy, and try to choose the flavor they would like to have. They do not deserve to be killed and then kept in what is their source of joy. The people who lost their lives never had a proper funeral; their families didn’t have the chance to say a proper goodbye, and never hugged them for the last time. They were just waved at from a distance and rushed to be buried. They deserved to be kissed and hugged; their last goodbye should have been as it should have been. It is never easy to say goodbye, not with this insurmountable pain. Tomorrow a 72-hour ceasefire will start. It is both, good and not good. We are done with temporary-ness; we need something solid and stable; we just can’t keep jumping from one ceasefire to another. Are we in a state of war or not? For me, we have been in a state of war all my life, not just the past few years. We are going to enjoy the few hours of ‘peace’ but if the negotiations that are taking place in Egypt, fall through, then that is it, things will just fall apart and it is going to be worse, and this time many of us wont be as lucky as before. First day of ceasefire went well, no surprises, nice and quiet. It is hard when you wake up and open your eyes and try to remember what day is today, war or no war. The first thing that comforts you is the fact that you wake up in the morning, which means we were not up all night listing to explosions and just waiting, looking forward for second day of ‘normal’. Ok so a three days ceasefire ended today. The negotiations in Cairo (Egypt) did not seem to lead anywhere, and they are not saying a thing about what is going on behind those closed doors. Another ceasefire will take place and this time it is for five days, we are not super excited about it; we don’t want to jump from one ceasefire to another. We are tired from this instability; we don’t want to get old waiting to come home to peace. “They steal your bread, only to give you a crumb… then they demand of you to thank their generosity…Oh their audacity!” Ghassan Kanafani (a Palestinian writer). Since the beginning of the war on Gaza, there was remarkable increase in the activities of the BDS movement (Boycott, Divestment and Sanctions against Israel) in Palestine and around the world, proving its ability to unite people around the world in the favor of a right cause. BDS in Palestine is a great opportunity to enhance the growth of the Palestinian industrial sector, but what I saw today shows that this sector was not spared during this war on Gaza, just like other previous wars. Around 134 factories within different sectors were targeted and left with partial and complete damage. One of them is Al-Awda factory. Al-Awda, a food processing factory was targeted and severely damaged. Established in 1977; this factory is/was a leading one within the sector and was home for over 400 Palestinian workers. 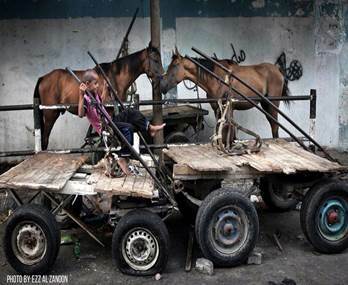 Israeli is not just targeting the Palestinian resistance; it is also targeting the infrastructure within the Gaza Strip. Poor infrastructure would prevent the growth of our economy, and will hold us back ensuring our dependence on imported products. So it is not others’ tax money that pays for their guns; it is also our own money they use to kill us with. We are still enjoying the few days of ceasefire and it is so hard to live life normally. Yesterday I went back to work in Gaza City for the first time since the beginning of the war. So much destruction and so many tensed faces walking down the street, waiting for outcome of ongoing negotiations. By the end of the day I went to the market and got the biggest chocolate bar I found there, and I took a break away from war. I showed my little sister a picture on Facebook; it was a little girl in the UK with her birthday cake. My sister was jealous and said: “Look she is having a birthday party as if they don’t have war” I asked her if she thought there is war in every country in the world and she said yes. I grew up thinking that conflict is all over the world just like in my county. Now my sister who was born 22 years after me has the same feeling. In every war there is always a story behind every face and a story behind every number. And there are always stories that will break your heart. Today my friend told me one that broke my heart. It is about Asma, a girl from Gaza city in her twenties. In one of the Israeli massacres Asma’s house was targeted and all her family members were killed, but this is not the saddest part. Asma, alive, was trapped under the rubbles of her house, in a two hours ceasefire her uncle went to her and with the help of the civil defense and paramedics they tried to save her. She was crying all the time: “Why did you leave me?” Two hours were not enough for them to get her out and before the war resumed they made the hardest decision. They left her alive, screaming, crying and scared. There was nothing they could do. The Israeli army would coldly kill them. They left with the promise that they will come back and they did, few days later. When they went to her she was barley holding on to life, and she died on her way to the hospital. I can’t even imagine how she felt trapped on a war scene, lonely and scared. And I cant imagine what her uncle must be feeling who had to leave her, helpless, knowing that he couldn’t do anything. I can just see her crying : “why did you leave me? Why are you leaving me again? This is Asma, a face of hundreds more buried in Gaza. So today is the last day of the 5-days ceasefire, and by the end the negotiation team decided to give it another 24 hours as the informal news goes that an agreement might be signed by tomorrow. No one knows for sure what will happen and what is really happening in Egypt, but we will know for sure by tomorrow. Today was birthday of a little girl in the picture, Maha, seven years old. 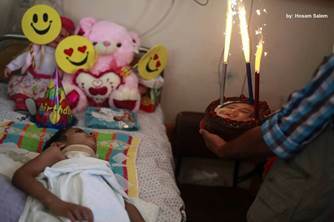 Maha, who lost her mother in an Israeli attack on her house, is paralyzed from neck below from that attack. Her birthday was different this year, it was in a hospital without her mother and this time she wasn’t able to cut the cake, but she had an amazing support from amazing people and will always do. Happy birthday Maha, keep up your beautiful smile. So ceasefire no more. War is back and the death toll is on the rise. Of course, Israel followed its war-protocol: they bombed a house, killed a child and had the cherry on the top with targeting an ambulance. As my friend said: Gaza is sinking again after taking a short breath. The question is for how long can we hold on to that breath? If Israel wasn’t the one who is occupying us; would USA and other countries still consider Hamas as a terrorist organization? Would they have called for our freedom? If those countries who could help us really wanted to help us, wouldn’t they have ended the siege on Gaza Strip from the first year itself and showed the red card, which Israel deserves, at least when the first military operation against Gaza Strip took place in 2008? Doesn’t the world have enough proof for the war crimes that were committed by Israel against us? Aren’t they equally evil as the crimes committed by Taliban and ISIS? Doesn’t USA think that we need the same protection they try to give to the people who flee their houses because of ISIS? Doesn’t judging us according to a set of criteria set by our occupier and oppressor is a naive way to understand what is really going on? Aren’t issues such as health care, poverty and unemployment in the USA are in need for all the millions and millions of dollars which USA wire to Israel’s military sector every year? Don’t you think it is time to have the courage to answer these simple direct questions and let the truth shine? And one final question: Can someone please switch off those damn drones so we can go to sleep? My little sister woke up screaming running everywhere not knowing where to go! There was dust everywhere and the sounds of shredded glass just wont stop. We jumped and carried the children and left to the next house assuming it is safer. Some of us held the babies and others helped the elders to take a shelter, and the rest barely had the ability to get themselves out. We and the other families next door gathered on one room, praying and waiting for what will come next, and by then it was over. We were lucky no one was injured but lots of us won’t go to sleep early tonight and if we do we will make sure that we are fully dressed in case we need to go on the run again. That night a house nearby was targeted with heavy rockets and seven people lost their lives. 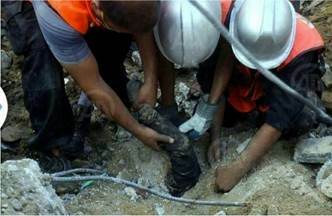 Today Israel war-planes completely destroyed a 12-story building in Gaza City. Nearly 50 families lost their houses and what they own in it. The families were given a 10 minutes warning to evacuate. Just imagine them running down the stairs carrying their children. Imagine the elders who can barely walk running for their life. 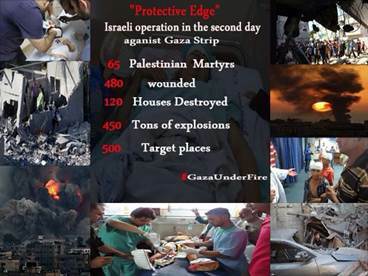 Israel has just been targeting more and more houses. This is the first time they targeted such a big building. No one knows what other firsts they intend to do. More bombs. More deaths. More irreversible scars. A hand that will never grow, a foot that will never run and a father who will never kiss his child again. Laila Barhoum from Gaza Strip-Palestine has worked as a teacher for two years. She is a graduate in Poverty and Development from the Institute of Development Studies, UK. Laila currently works as a Business Development specialist in a local NGO in the Gaza Strip and engages with issues such as conflict, agriculture, poverty reduction and business development for hardship cases in Palestine. Her previous blog was a first-hand account of the lives and dreams displaced by the Palestine-Israel war. Fiinovation - Opportunity Solutions, Simplified.